More and more couples who see the expense and stress involved in a courtroom divorce are instead choosing to arbitrate their divorce. Arbitration is a means of conflict resolution where a binding decision is issued by a private factfinder. This process allows couples to resolve heated issues using evidence and an objective decisionmaker while keeping the process and outcome confidential. Couples considering arbitration for their divorce should become informed on both the advantages and disadvantages of divorce arbitration before committing to this alternative means of dispute resolution. Learn more about these pros and cons below. Family part judges are overloaded with cases. It can take months or even years to receive a final judgment in a contested divorce proceeding. If you’re eager to move on with your life after filing for divorce, you may be able to do so sooner by choosing to arbitrate. Once you and your spouse settle on an available arbitrator, hearings can often be scheduled soon after, and you may have a binding decision within months. A judge’s decision is a matter of public record. Judges will often use a pseudonym for children involved in divorce or custody cases, but unless special circumstances apply, these public decisions will include the full names of both spouses. Arbitrators’ decisions, on the other hand, are entirely private. One reason that courtroom divorce trials take longer than arbitration is that there are many formalities involved in trial. In arbitration, the parties are permitted to forgo many of these cumbersome rules. The parties can decide what level of detail is included in the arbitrator’s decision and can dispense with rules governing what evidence is or isn’t admissible. Unlike a courtroom trial, the decisions issued by arbitrators are subject to only limited review by a judge. When a trial is held in a courtroom, you have the right to appeal the judge’s decision to the Appellate Division. Appellate courts aren’t quick to overturn a trial court’s decision, but it isn’t uncommon for them to do so. If the arbitrator issues a decision you feel is unfair, judges are prevented from changing the outcome in all but a small number of cases. Long courtroom trials can be extremely expensive when accounting for court costs and attorneys’ fees. 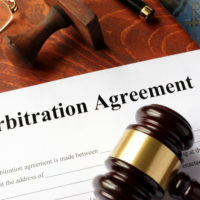 However, arbitrators often charge hundreds of dollars an hour for their services, and most parties to an arbitration still hire an attorney to represent them in an arbitration. One less-expensive, and less-contentious, alternative to arbitration can be divorce mediation. If you’re looking for legal guidance on whether to sign a prenuptial agreement in New Jersey, or if you need skilled representation for a divorce or child custody dispute, contact the knowledgeable and seasoned Union family law attorney John B. D’Alessandro for a consultation, at 908-964-0102.